Polish litterateur and revolutionist; born about 1810; died before 1840. 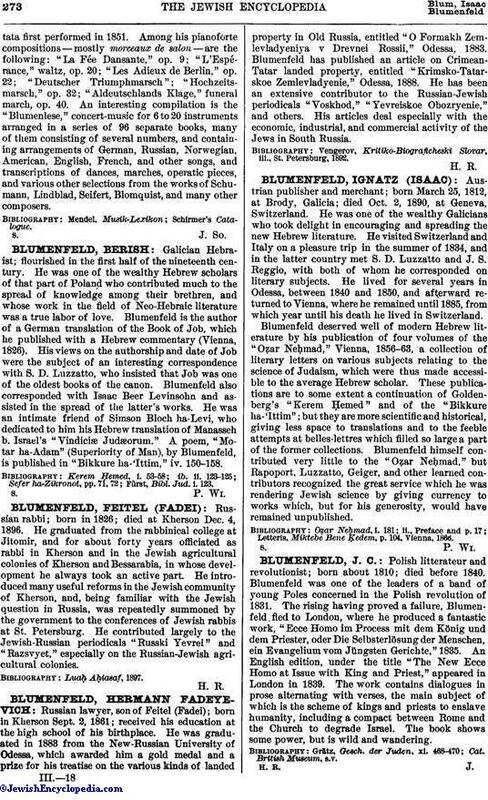 Blumenfeld was one of the leaders of a band of young Poles concerned in the Polish revolution of 1831. The rising having proved a failure, Blumenfeld fled to London, where he produced a fantastic work, "Ecce Homo im Process mit dem König und dem Priester, oder Die Selbsterlösung der Menschen, ein Evangelium vom Jüngsten Gerichte," 1835. An English edition, under the title "The New Ecce Homo at Issue with King and Priest," appeared in London in 1839. The work contains dialogues in prose alternating with verses, the main subject of which is the scheme of kings and priests to enslave humanity, including a compact between Rome and the Church to degrade Israel. The book shows some power, but is wild and wandering.